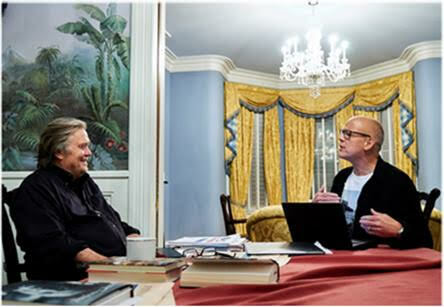 “The Circus: Inside the Widest Political Show on Earth” (Showtime, 8 p.m.) returns with a new episode tonight, as John Heilemann takes a tour of Breitbart with Steve Bannon (depicted on “SNL” as the Grim Reaper). Mark McKinnon and Alex Wagner round out the crew, who will also probably take time to have a fine dinner somewhere. And next week, political strategist Steve Schmidt begins his stint as a recurring contributor to the show. There’s not a lot on TV tonight in deference to the traditional night of the Emmys, which isn’t even on, lest it be clobbered by Sunday Night Football, which has Giants at Cowboys (NBC, 8:20 p.m.). Earlier NFL games include Indianapolis at Washington (CBS, 1 p.m.), Arizona at Rams (Fox, 4 p.m.) and New England at Jacksonville (CBS, 4:25 p.m.). Mr. Pickles gets a new look on “Kidding” (Showtime, 10 p.m.). Beck and Joe go on a real date on “You” (Lifetime, 10 p.m.), but there is a lingering problem. On “Insecure” (HBO, 10:30 p.m.), Issa’s new project is more complicated than she thought. A new docs-series about an urban youth football league in Miami, “Warriors of Liberty City” (Starz, 8 p.m.), accompanies the continuing high school drama of “America to Me” (Starz, 9 p.m.). Fiona considers a risky investment on “Shameless” (Showtime, 9 p.m.). A pimp has a new opportunity on “The Deuce” (HBO, 9 p.m.). “The Last Ship” (TNT, 9 p.m.) has to use World War II-era military technology. Johannes insists he doesn’t have any secrets on “The Miniaturist” on “Masterpiece” (PBS, 9 p.m., check local listings). Only five are left on “Big Brother” (CBS, 8 p.m.) but Bebe Rexha shows up to perform anyway. Shannen Doherty stars in a remake of the 1996 thriller “No One Would Tell” (Lifetime, 8 p.m.). Issues of Arizona, from immigration to midterm elections, are covered on “Town Hall America with Harris Faulkner” (Fox News, 8 p.m.). There’s a crab boil on “Married to Medicine” (Bravo, 8 p.m.). “Paranormal Survivor” (Travel, 8 p.m.) seems an odd addition for this network. A bear wrecks the beehives on “Alaskan Bush People” (Discovery, 9 p.m.). Abby realizes she’s not such a great boss on “Chesapeake Shores” (Hallmark, 9 p.m.). On “Fear the Walking Dead” (AMC, 9 p.m.), Alicia delivers on a promise. Kim readies for a new baby on “Keeping Up with the Kardashians” (E!, 9 p.m.). Its down to the final four on “Worst Cooks in America” (Food, 9 p.m.). “Basketball Wives” (VH1, 10 p.m.) have a reunion. Spencer gets Q to help with a deal on “Ballers” (HBO, 10 p.m.). It’s NFL players vs. NFL players and Wanda Sykes vs. Nia Vardalos on “Celebrity Family Feud” (ABC, 8 p.m.). George Stephanopoulos vs. Ali Wentworth and Bethenny Frankel vs. Ana Gasteyer on “The $100,000 Pyramid” (ABC, 9 p.m.). The Ritz Brothers star on Turner Classic Movies in “Kentucky Moonshine” (8 p.m.), “Life Begins in College” (9:45 p.m.) and “Straight, Place and Show” (11:15 p.m.). They are followed by the silent “The Conquering Power” and two from Jean Renoir, “The Rules of the Game” (2 a.m.) and “The Golden Coach” (4 a.m.). Baseball includes Arizona at Houston (TBS, 2 p.m.) and Dodgers at St. Louis (ESPN, 8 p.m.). Auto racing has Singapore Grand Prix (ESPN2, 8 a.m.), South Point 400 (NBC Sports, 3 p.m.) and Grand Prix of Sonoma (NBC Sports, 6:30 p.m.). In the Davis Cup semifinals (Tennis, 5 a.m.), it’s U.S. at Croatia and Spain at France. It’s South Carolina at Tennessee (ESPNU, 5 p.m.) in women’s college soccer. The women’s college volleyball, it’s Syracuse at Iowa State (ESPNU, 1 p.m.). ABC: Admiral Karl Schultz, commandant, U.S. Coast Guard; Michael Sprayberry, director North Carolina Emergency Management: former Whitewater independent counsel Ken Starr; JPMorgan Chase CEO Jamie Dimon. CBS: FEMA Administrator Brock Long, Sens. Lindsey Graham and Thom Tillis. NBC: Rep. Adam Schiff, New Bern, N.C. Mayor Dana Outlaw; Long; author Bob Woodward. CNN: Democratic congressional candidate from New York, Alexandria Ocasio-Cortez, Rep. Pramila Jayapal. Fox News: Tillis, Long, Sen. John Kennedy.